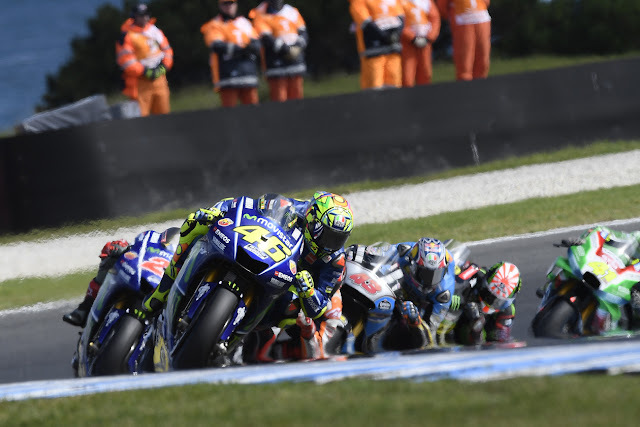 Valentino Rossi believes he will have to adapt his "vintage" approach to MotoGP pack racing in future after a bruising encounter in last weekend's Australian Grand Prix. The Phillip Island race was characterised by aggressive fighting throughout, with several instances of contact between riders in what was mostly an eight-strong lead group. Rossi ended up with tyre marks on his leathers after contact with Marc Marquez's Honda at the Southern Loop, with Johann Zarco and Andrea Iannone also making aggressive moves on the Italian in a frenetic encounter. Rossi said he will need to "forget" the unofficial rules of engagement that once governed how MotoGP riders approached wheel-to-wheel racing. "Now you need another approach," said Rossi. "I probably have to forget the way I used to race a few years ago. Getting angry doesn't achieve anything. "There are some rules to follow and the first of these would be to not run into each other, but maybe I'm wrong. "Maybe I'm a bit 'vintage', but I have to adapt. I was also very aggressive, so I am not one to talk. "The only difference is that some years ago it could have been like this on the last three laps, now it's for the last 25." While Rossi has criticised Zarco in particular for aggressive riding this year, the Italian felt nobody crossed the line in Phillip Island, acknowledging such riding is now "part of the game". "We were close to the limit, but nobody fell," Rossi added. "Many things can be said. "I think we are correct to be aggressive up to a certain point and this was a really a great race, even if I had to trade paint with Iannone and Zarco, and maybe take a couple of hits from Marquez. "It's part of the game. Otherwise, you need to stay at home." Even I will do the same from now on ! !